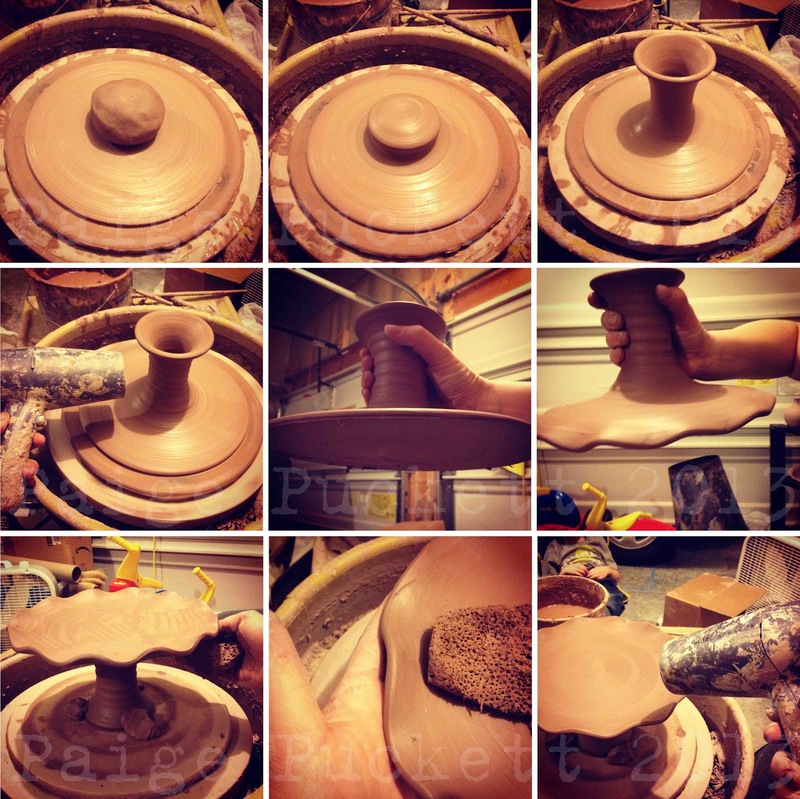 I've been on a quest to develop a simple, elegant process for throwing cake stands on the pottery wheel. They are not difficult to throw as one piece, but I was encountering several problems as they dried. First, the edge was curling up, meaning when the plate was turned right-side-up, the top slightly slumped boding immanent disaster for buckeye balls or round fruit. The other issue was that the compression under the cylinder was slightly different, leading to a ring or two rather than a smooth surface. I was able to correct the slumping by righting the plate while still somewhat still wet, securing the base and attempting to throw the edges up a little more. If the plate was too wet, the slumping eventually let to the plate collapsing. The issue with the compression rings could be fixed by trimming, but that can be tedious and also lead to accidents. What I wanted was a simple process, little trimming. This week I've thrown three like the one pictured above. First, the plate is thrown flat with the center slightly thicker than the edges. This will help create that lever arm to hold up the edges. Then, while still wet, I center a new lump of clay on the plate for the pedestal, making sure to avoid air pockets. I cone up and down several times to work it into the body and then throw a cylinder, narrowing it in an adding rings as desired. I let the piece sit for a bit (an hour or so?) and then use a hair dryer to firm up the cylinder and underneath side of the plate (top side faces down). I continue to add more moisture to the edge of the plate so that I can add the ruffles later without cracking the clay. I also am sure to remove any excess moisture in the cylinder with a sponge on a stick . Next, I use the wire cutter to loosen it from the bat. As I pull it off the bat, I make sure to do so straight up. Going at an angle will train the clay to lean and create a lopsided cake stand. This pulling it up while not yet leather hard, helps prevent the earlier curling problem I was having with the plate and can give it a slightly bowled surface - much easier to adjust than a domed, slumping surface. I then hold the piece, still upside down, by the cylinder (it must be firm enough not to compress or bend), smooth the surface with the sponge, add the ruffles with my fingers, and use the hair drier to firm up the top of the plate. I now have a heat gun , which is much more efficient than the hair dryer, but does require some safety precautions. I then set it upright on the bat and give a little more blast of dry heat if it looks like any slumping might occur. Note that using a heat gun might dry the clay out too quickly. The hair drier does just enough to firm the surface of the clay so that I can alter it to the desired state. I smooth out the remaining roughness and compress the ruffles a little. I support the underneath side of the plate when I add any pressure to the top. this is fascinating to see the process of how that works. thanks for sharing. 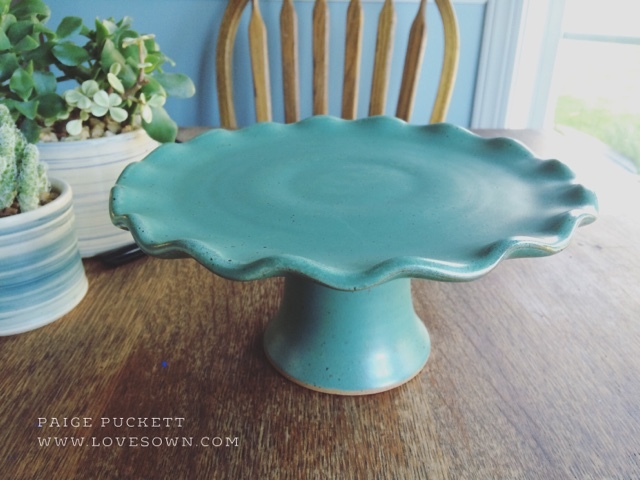 i also foresee that in addition to my flat bupcake plate, i might need a ruffled cake stand! Amazing idea ! thanks for sharing your post. I fire to 04/05 and then 5/6. I've definitely had slumping, especially if the plate part gets too wide and thin or if there was slumping in the creation process that I tried to fix. It's not a perfect method.